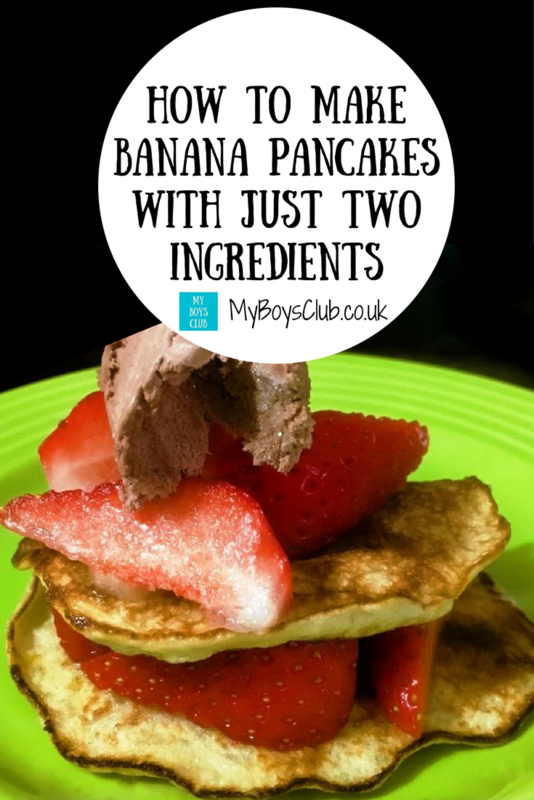 Yes, you read that correctly, banana pancakes made with just two ingredients and my boys loved them. Yes really, a pancake recipe with no flour, no milk, no salt or sugar ... just 2 eggs and 1 banana required. 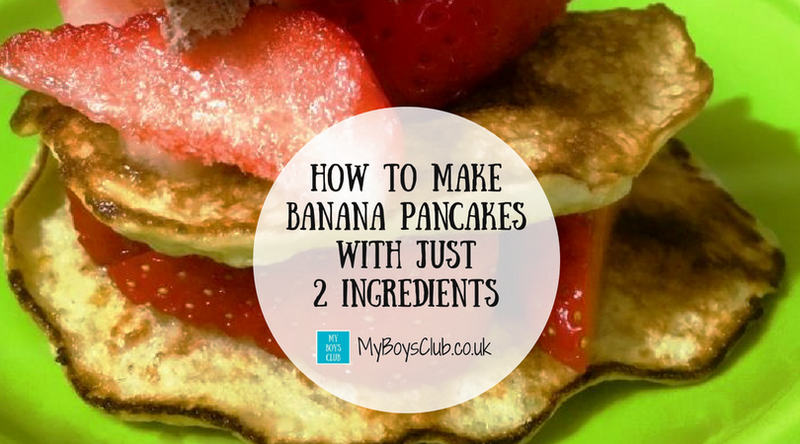 This has got to be the world’s easiest and simplest pancake recipe. It not only makes healthy, gluten free pancakes but they are also fluffy and moist. They take just minutes to make and cook (and not much longer to eat) and are perfect topped with ice-cream and strawberries but great with any topping you’d like. This makes it the perfect mid-week dessert. Bananas are a highly nutritious energy-packed fruit which contain manganese, vitamin B6, vitamin C, fibre, potassium, iron and vitamin A, amongst and other nutrients. And eggs are a very good source of inexpensive, high-quality protein as well as vitamin B2 selenium, vitamin D, B6, B12 and minerals such as zinc, iron and copper. So two great healthy ingredients combining to make a delicious, tasty and relatively healthy dessert. The pancakes are not only gluten free but dairy free too. I made these for the boys (and me and hubby) one evening and honestly they took just 5 minutes. Optional: Pinch of baking powder to make them fluffier and vanilla essence to the flavour. 1. 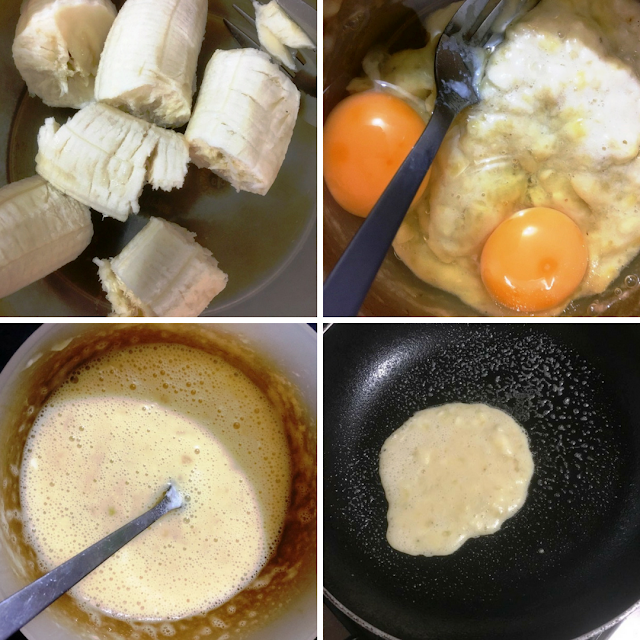 In a bowl, peel and mash the banana with a fork in a bowl until it is soft and quite gloopy. 2. Crack the eggs and then whisk them into the mashed banana. Try to get the mixture as lump-free as possible. 3. Spray oil over the bottom of a non-stick frying pan. 4. Spoon the mixture into the pan and cook for 1-2 minutes on each side until slightly browned. I used an ice cream scoop to measure out the batter and it made 8 pancakes. 5. 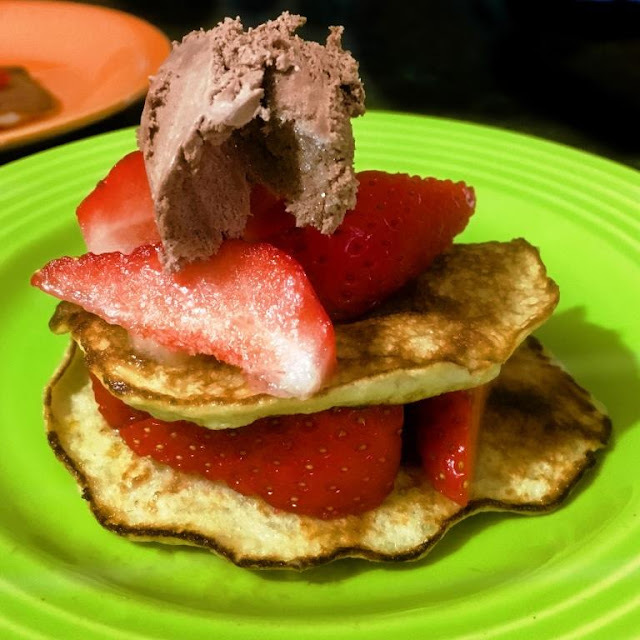 Top the pancakes with strawberries and ice cream (or any other topping) and serve. If you like the look of this recipe Pin It on Pinterest! I think Erin will love these. I think I'll try them over the weekend. Let me know if you all love them too. Looks like a cool pancake to make! Heath bar (baking) bits is my favorite topping! I've got to have some kind of chocolate in it! Love the idea of putting ice-cream on it too!